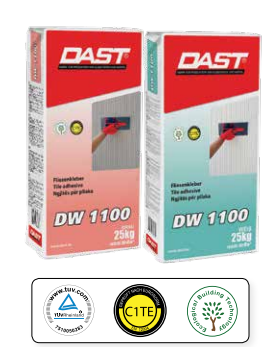 DW 1000 is classified as C1E according to EN 12004, base C cement, Nr.1 adhesive with normal adhesive strength, E – prolonged time of workability. - For ceramic fixing in cement-based surfaces. - For ceramic fixing in gypsum surface after being treated with PRIMER. DW 1000 is used for laying ceramic tiles, tiles of small dimensions on various surfaces such as: concrete, cement and plaster-based floors. It is suitable for indoor and outdoor use in residential environments. -For indoor and outdoor use in residential environments. -For ceramic fixing in cement-based surfaces. DW 1100 is used for laying ceramic tiles, tiles of small dimensions on various surfaces such as: concrete, cement and plaster-based floors. This product is suitable for indoor environments. -For fixing ceramic, gres, porcelain tiles in hard surfaces. 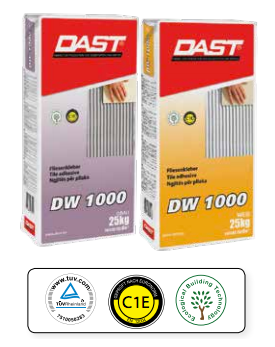 - For fixing ceramic, gres and porcelain tiles in gypsum surface, after being treated treated with DW PRIMER. - For fixing ceramic, gres and porcelain tiles on old existing tiles. DW KLEBEMORTEL 2.5 is used for laying ceramic, gres and porcelain tiles, and tiles of different dimensions on various surfaces such as: concrete, isolating coatings, cement, plaster, old tiles, etc. This product is suitable for indoor and outdoor use. 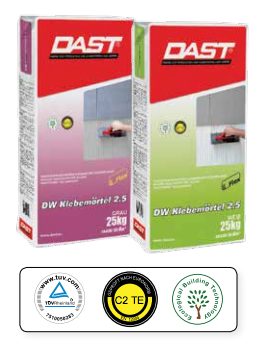 DW KLEBEMORTEL 2.5 can also be applied in deformable surfaces, such as: gypsum or wood tiles, under-floor heating when it is reinforced with FLEXIT additive, which improves technical adhesive parameters. - For ceramic, gres, porcelain tiles fixing. - For ceramic, gres and porcelain tiles fixing in gypsum surface after being treated with DW PRIMER. 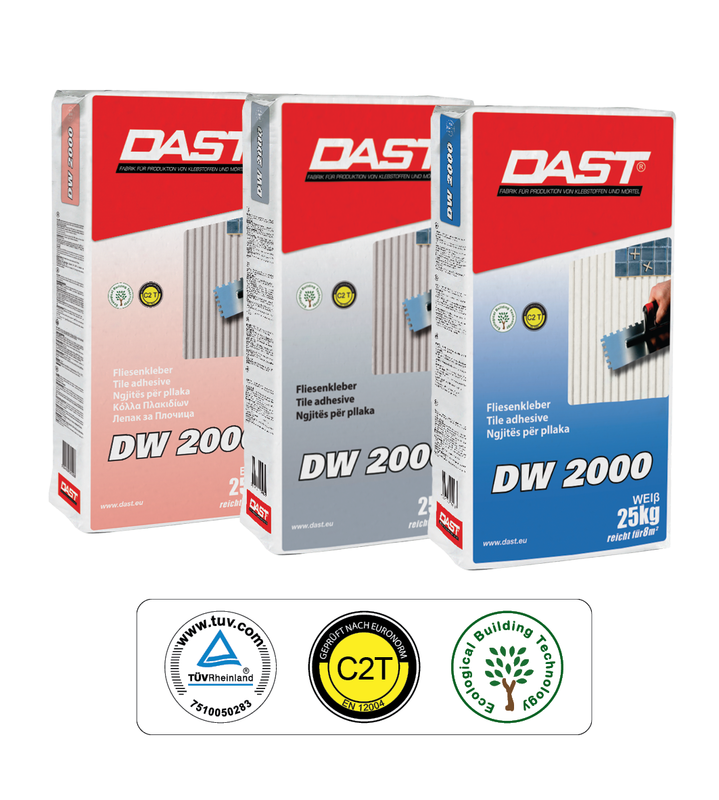 DW 2000 is used for laying ceramic, gres and porcelain tiles, and tiles of different dimensions on various surfaces such as: concrete, isolating coatings, cement, plaster, old tiles, etc. This product is suitable for indoor and outdoor environments. 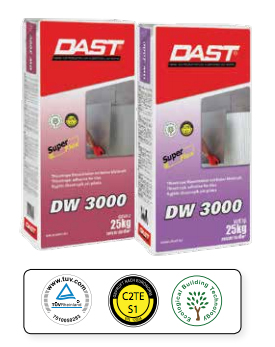 DW 2000 can also be applied in deformable surfaces, such as: gypsum or wood tiles, under-floor heating, when it is reinforced with FLEXIT additive; this additive improves technical adhesive parameters. prolonged working time and S1 as flexible adhesive.